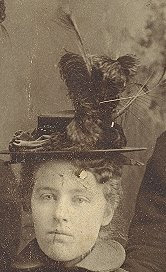 Olive Tree Genealogy Blog: 5th Edition of Smile For The Camera: Crowning Glory. 5th Edition of Smile For The Camera: Crowning Glory. Cabinet Card taken ca 1905 St. Mary's Ontario Canada. Photograph of four Purdue sisters - Margaret born 1875, Louise born 1881, Nellie born 1882 and Carolyn 1877. 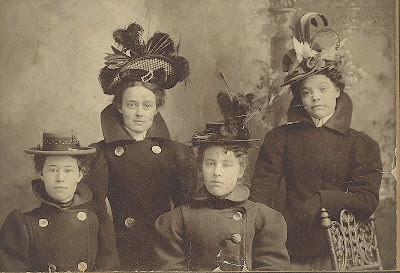 The sisters were milliners in Toronto Ontario, and these wonderful hats are their own creations. This photo is my submission for 5th Edition of Smile For The Camera: Crowning Glory. "Show us those wonderful photographs of hairdos and maybe even a few don'ts. 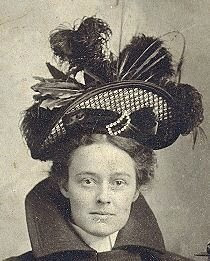 Don't limit yourself to just hair fashion through the ages, got a great photograph of a hat, helmet, bonnet, or some other interesting headgear?" The Purdue sisters were 4 of 14 children born to my husband's great-great-great grandfather Frederick Purdue and his wife Margaret Cowans. 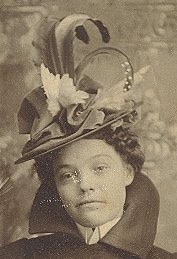 Below are close-ups of the 3 most elaborate hats. Now those are some hats! What a shame our society doesn't wear them anymore (and, no, baseball caps don't count). Wonderful hats and a great photograph, thank you Lorine. More candidates for what I think of as the "alighting bird" style - in fact some of them could have two birds! Ellis Island Phonetic Matching now possible! Update on September Most Wanted Ancestor!